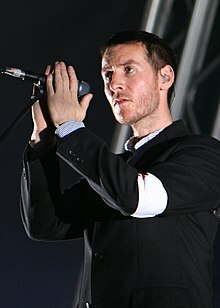 Robert Del Naja (/dɛl ˈnaɪə/; born 21 January 1965), also known as 3D, is a British artist, musician, singer and songwriter. He emerged as a graffiti artist and member of the Bristol collective The Wild Bunch, and later as a founding member of the band Massive Attack, with which he is still active. In 2009 he received the British Academy's Ivor Novello Award for Outstanding Contribution to British Music. Del Naja is one of the founding members of Bristol trip hop collective Massive Attack. In addition to his work with Massive Attack, he provided vocals to "Invasion" on Unkle's album Never, Never, Land, and "Twilight" on War Stories. In December 2012, Del Naja released the first single of his new project called "The Battle Box", which fuses music, art and discourse across one-off live events, exhibitions and exclusive vinyl releases. He counted with the collaboration of artists such as Guy Garvey, and the Higgins Waterproof Black Magic Band. In December 2014, Del Naja donated ten unreleased music tracks to the Game Jam site "Ludum Dare", for a game event taking place in December. The songs will be used by the site developers to make soundtracks for the games. This new music material is also available for free download. In February 2015, Del Naja and Thom Yorke released the soundtrack for documentary "The UK Gold". The songs are available for free download. In 2015 he also collaborated with Jean-Michel Jarre on the Electronica 1: The Time Machine album, resulting in the track "Watching You". Del Naja was a graffiti artist before becoming a vocalist, and was featured in the book Spraycan Art by Henry Chalfant & James Prigoff, alongside fellow artist and future drum & bass pioneer, Goldie. His work has been featured on all of Massive Attack's record sleeves. The graffiti artist Banksy cites his work as an influence. Del Naja is credited as being the first graffiti artist in Bristol. He is also regarded as the pioneer of the stencil graffiti movement and bringing hip hop and graffiti culture from the USA to Bristol in the early 1980s. Del Naja has co-designed all of Massive Attack's lighting shows with UVA; the shows have been overtly political, dealing with current local and international issues. Del Naja took part in a group show in 2007 called Warpaint at the Lazarides Gallery in London, featuring his art from the Unkle album "War Stories". He also created an exhibition of flags at "Massive Attack's Meltdown Festival" on London's South Bank in 2008. The installation was called "Favoured Nations". In the exhibition, alternative flags of the British Commonwealth were recoloured in the anarchist red and black and hung from the ceiling of the Royal Festival Hall main floor. Del Naja and Davidge collaborated with United Visual Artists on the large scale installation 'Volume' at London's V&A museum in 2006. It consists of a field of 48 luminous, sound-emitting columns that respond to movement. Visitors weave a path through the sculpture, creating their own unique journey in light and music. In a 2010 interview, Del Naja said "Painting is difficult for me because I'm colour blind. Back in the day, I had to label my spray cans with what colour they were because I couldn't tell. It's like the emperor's new clothes: [people] telling me it's great, and me pretending that's what I intended." Del Naja's first solo art show ran in the Lazarides gallery, central London from 24 May to 22 June. The show featured many of the works he created for Massive Attack, reinterpreted especially for the exhibition. The show also featured three one-off 'digital infinity mirrors' two of which contained phrases supplied by Reprieve extracted from drone pilot dialogues. Del Naja and Grant DJ'd at the opening night on 23 May. Del Naja had a solo art show at the Lazarides gallery in central London from 24 May to 22 June 2013. The show's content spanned a period of over twenty years and featured many of the art pieces that Del Naja created for Massive Attack. Each piece, reinterpreted especially for the exhibition, was hand-printed and finished. It has been speculated that Del Naja is responsible for creating the artwork attributed to the noted graffiti artist Banksy. In a 2017 segment on the Distraction Pieces podcast, guest DJ Goldie commented on Banksy's work: "Give me a bubble letter and put it on a T-shirt and write Banksy on it and we’re sorted. We can sell it now. No disrespect to Rob, I think he is a brilliant artist. I think he has flipped the world of art over." 'Rob' could refer to either Del Naja or Robin Gunningham. 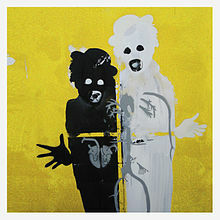 The artwork Del Naja has produced himself, seen in the booklets for Massive Attack albums going back decades, is also similar to Banksy's, and involves similar artistic and cultural sentiments. Massive Attack concert visuals also bear a notable resemblance to Banksy's work. A multi-medium show conceived and designed by Del Naja and filmmaker Adam Curtis – in collaboration with United Visual Artists (UVA) – premiered in Manchester in July 2013. The show featured a Curtis film, unofficially titled 'The Plan', which was projected onto a huge screen surrounding the audience. The lighting and LED elements that surrounded the film and players were designed by Del Naja and UVA. 2008: Gomorra (Matteo Garrone) – Herculaneum (winner of best song – Italian Oscars). 2010: Women Are Heroes (JR) – 2011 Dias De Gracia (Everardo Valerio Gout) Summertime/with Scarlett Johansson. Robert Del Naja's music has been associated with the Bristol Sound. Del Naja has said of the Bristol Scene: "We all grew up listening to punk music and funk stuff and those attitudes sort of snuck into our music. That sort of brought people from different circles together and maybe it wasn't as 'cultural melting pot' as it all sounds but because Bristol is quite a small place, it becomes a lot more focused then." Del Naja has been critical of the government policies of the United Kingdom. He was strongly opposed to the 2003 war against Iraq, and with fellow musician Damon Albarn personally paid for full page adverts in the NME magazine. Massive Attack have previously played two shows in Israel, but have declined recent offers. They have described this "not an action of aggression towards the Israeli people" but "towards the [Israeli] government and its policies", arguing that "the Palestinians [in Gaza and the west bank] have no access to the same fundamental benefits that the Israelis do." In 2005, Del Naja organised and performed at a charity concert in Bristol for Tsunami Relief with Adrian Utley and Geoff Barrow of Portishead. The two-night event featured Massive Attack, Portishead, Robert Plant, The Coral and Damon Albarn. Del Naja and Marshall performed three shows in 2005 in support of Hoping, an organisation that helps raise money, support projects for Palestinian youth in refugee camps in the Gaza strip and the west bank, Lebanon and Syria. Del Naja and Thom Yorke of Radiohead threw an unofficial office Christmas party at an occupied UBS bank in London in December 2011, in recognition and support for the international Occupy movement. Having previously boycotted playing at Bristol's Colston Hall due to its connection with the city's historic slave trade, in October 2012, Del Naja heavily criticised Bristol Mayor candidate George Ferguson because of his membership of a local organisation the Society of Merchant Venturers. The organisation dates back to the 16th century and had many connections with the Bristol slave trade, continuing to this day as an elitist private organisation, open to very few by invitation only. In November 2012, Del Naja then took a surprising stance to reverse his position and endorse George Ferguson. Del Naja was cited by local media as saying that the other candidates had only party political agendas at heart and a newly elected mayor needed more imagination to help implement creative projects for Bristol. In July 2014, Del Naja and Marshall visited the Bourge-El Barajneh refugee camp in Lebanon to meet with Palestinian volunteers at an educational centre. The band's profit from the show in Byblos was donated to the centre. Del Naja was brought up in the Bishopston district of Bristol. His father is an immigrant from Naples in Italy and as a result Robert is a passionate supporter of the S.S.C. Napoli football team, as well as Bristol City. ^ "Robert Del Naja - New Songs, Playlists & Latest News - BBC Music". BBC. Retrieved 2019-02-17. ^ "Massive Attack's Robert Del Naja unveils new Battle Box project; Guy Garvey features". Factmag.com. Retrieved 22 September 2014. ^ "Del Naja donates new music material". Ludum Dare. Retrieved 10 December 2014. ^ "New music from 3D of Massive Attack". massiveattack.ie. Retrieved 10 December 2014. ^ "Thom Yorke and Massive Attack's Robert Del Naja Release UK Gold Soundtrack for Free". Pitchfork. Retrieved 25 February 2015. ^ "Filthy Modern Art – Street Artists, Stencils, Graffiti – Originals and Prints". Archived from the original on 10 February 2008. Retrieved 29 January 2013. ^ "Red Lines: Bristol, England". Retrieved 29 January 2013. ^ "Massive Attack per Stefano Cucchi &#124 Global Project". Retrieved 15 September 2012. ^ "Massive Attack". United Visual Artists. Archived from the original on 8 August 2012. Retrieved 15 September 2012. ^ "deluxxdigital.com issue 16". Issuu. Retrieved 15 September 2012. ^ "Meltdown | FAVOURED NATIONS BY ROBERT DEL NAJA". Archived from the original on 15 August 2012. Retrieved 15 September 2012. ^ Nosheen Iqbal. "Massive Attack's art of darkness". The Guardian. Retrieved 22 September 2014. ^ "Lazarides – Fire Sale". Retrieved 19 July 2013. ^ "Exhibition 3D: Fire Sale". Lazarides. Retrieved 26 October 2013. ^ "Did Goldie just reveal who Banksy is?". BBC News. 23 June 2017. Retrieved 10 October 2018. ^ Holmes, Kevin. "Charting the Massive Visual History of Massive Attack". Creators. Retrieved 25 August 2018. ^ Shugerman, Emily (23 June 2017). "8 signs Massive Attack's Robert Del Naja is Banksy". Independent. Retrieved 25 August 2018. ^ "Massive Attack v Adam Curtis at Manchester International Festival". Weheart.co.uk. 9 July 2013. Retrieved 29 August 2013. ^ Dave "the Wave" Dresden, Interview with Massive Attack Archived 18 September 2005 at the Wayback Machine, about.com. Retrieved 16 June 2009. ^ "Massive Attack: the beat goes on". The Daily Telegraph. 8 July 2010. Retrieved 22 September 2014. ^ "The silent treatment". Newstateman.com. Retrieved 22 September 2014. ^ "Dazed Digital". Occupy 2012. Retrieved 15 September 2012. ^ Staff (9 October 2012). "Massive Attack star criticises Bristol Mayor candidate George Ferguson". This Is Bristol. Archived from the original on 2 June 2013. Retrieved 8 May 2013. ^ Brown, Christopher (14 November 2012). "Bristol mayor: Massive Attack give vocal backing for Ferguson". Bristol 24–7. Archived from the original on 22 May 2013. Retrieved 8 May 2013. ^ "Massive Attack visit Palestinian refugees in Lebanon: 'All of them have a right to a life of dignity and beauty'". The Independent. Retrieved 22 September 2014. ^ "Robert Del Naja, 3D from Massive Attack, on Bristol City and Napoli". The Observer. 2 December 2001. Retrieved 16 April 2016.